My brother Nick is a total nut case. As well as his full-time job as a graphic designer he has a little side line as an inventor. Among recent projects have been a full-size Arc of the Covenant beer cooler (his vision was that you insert dry ice, get bearers to carry on to beach and then open to the amazement of all around) and plastic fake sick to lay on car seat as a theft deterrent. A couple of years ago he arrived at family gathering on my other brother’s yacht, which was then moored in Christchurch, Dorset, with a huge magnet. His plan was to tie it to the back of the boat with a rope and then chug around the harbour to what he picked up. He couldn’t understand Freddie’s lack of enthusiasm for this venture. 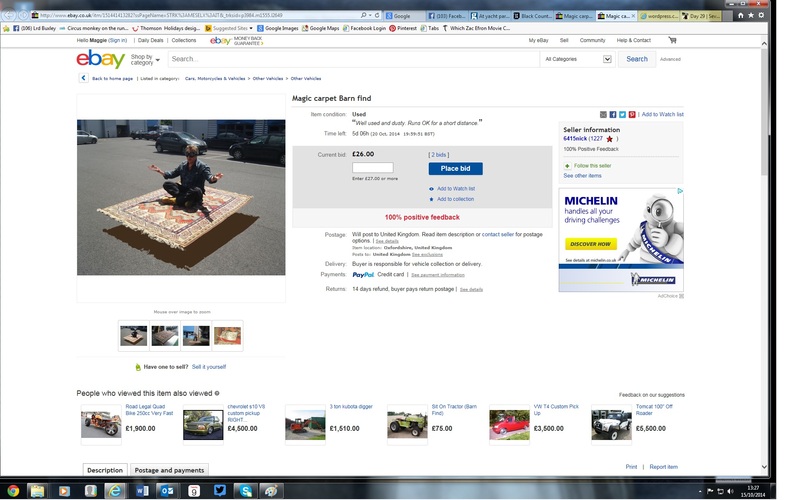 Here is the magic carpet in action, with the inventor on board.